A company in the Midwest is using an HP 3000 this month. They don't have plans to replace it. Chuck Nickerson of Hillary Software described a customer who will remind you of the grand days of MPE, the era when PCs might have been on desktops but the 3000 served businesses. It's a small company. Four people in total work at the plumbing and electrical supply firm. Their 3000 arrived with its application, and the staff uses it every working day. This is the kind of place where the part comes off a shelf in back and the contractor gets exactly what they need. In that manner, they are a lot like the 3000 users, getting what they need. The 3000 is the conduit between municipal utility and trade pros. A 3000 without a utility like Hillary's byRequest is a lot less useful. 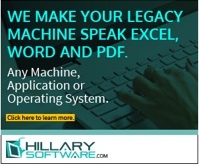 The Hillary software takes the 3000's data and does things like replace impact printers. Forms become something that a modern front end utility like Excel or Word, or even a basic PDF can deliver. "It the intimate connection with the host that we sell," Nickerson said. Excel is a closed format, he reminded me, so the magic of connecting an OS with its roots in the Reagan Era with laptops that cost less than one small antique 3000 memory board—well, that's priceless. Some 3000 users do move off their machines while they're Hillary customers. The intimate connection with other servers moves along with the data from places like plumbing supply firms. Cable and connections, pipe and fittings, make up the everyday infrastructure of our worlds. Good data from days past is important to seeing trends. Keeping up the intimacy is worth a lot. Fifteen years ago this month, HP was working to prove MPE was a rich asset. 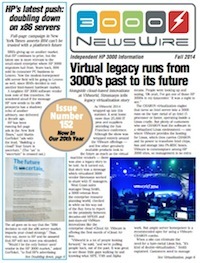 The vendor had already shucked off its futures for selling the 3000, saying in 2001 the server would be kaput by 2006. The 2004 lawsuit was a last resort to get money for servers that HP did not sell. Confused? The marketplace was in the know about HP's attempt to recover $31 million from an insurance policy it took out against losing sales to system counterfeiters. In 1999 HP began its campaign to arrest, or sue out of business, a stable of companies selling 3000s outside of HP's control. The '99 lawsuits were aimed at Hardware House and several other 3000 resellers. Those companies were charged with selling 3000s whose MPE licenses had been faked. After more than two years of those legal attacks — HP concocted a High Tech Task Force out of a few California law enforcement agencies, raiding suspect companies — the 3000 division walked away from its 3000 sales beyond 2003. As far as HP was concerned, it was still entitled to money it lost from faked sales in the years leading up to 1999. It didn't matter to the vendor that it was ending its 3000 business and putting 3000 software vendors on the ropes. It wanted to be paid for those unlicensed servers sold by third parties. MPE was the prize HP was claiming, since the hardware itself was officially useless without an MPE license. Los Angeles legal firm Anderson, McPharlin & Conners went to the 3000 newsgroups in 2004 to beat the community’s bushes, working to discover prices for used HP 3000s sold between 1994 and 1998. Paralegal Laurie Moss said HP wanted to levy a claim for the full software price on every server sold to Hardware House. During the legal firm’s discovery search, Moss said many 3000 community members who were contacted wanted to help. The Brunswick, Ohio-based reseller Norco, which eventually closed its doors three years later, was eager to tell the truth about the 900 Series systems genuine value. “You wouldn’t believe how many people said, ‘I sure do wish I could help you in this,’ “ Moss said. The law firm’s attorney Lisa Coplin deposed John Adamson, former owner of Hardware House, in the case, as well as Deborah Balon, an HP resales employee who aided Hardware House. HP settled within a week of the legal firm's discovery depositions. The vendor settled for five percent of its original $10 million claim. “We were afraid that some of the hardware brokers wouldn’t want to come up against HP,” Coplin said. “One of them, Norco, said, ‘We’ll give you everything we have.’ "
I still have some 3000 information on a tape. I’d like to create a Store to Disc file with it — how do I do that? There are several solutions. The first and easiest is to simply restore the info to a system (RESTORE *T;/;SHOW;CREATE;ACCOUNT=WORKSTOR) where WORKSTOR is an account you create to pull the data in. Then a simple FILE D=REGSFILE;DEV=DISC and STORE /WORKSTOR/;*D; with whatever else should create the disc store. The second method is to use FCOPY. You'll have to research the STORE format, but I believe it's FILE TAPEIN;DEV=TAPE;REC=8192,,U,BINARY. The third (also easy, but you need the software) is to use Allegro's tool TAPECOPY, which moves from tape store to disc store and back. Do you mean copy it off tape to a disk store file? I’m not sure if that can be done, as in my experience of tapes, there is a file mark between files, and EOT is signified by multiple file marks in a row... but anything may be possible. If you do a file equate and FCOPY as shown below, you should be able to look at the raw data, and it should show separate files, after a file list at the front. Ten years ago this month, we celebrated the fact that Hewlett-Packard created a forward-looking feature for the HP 3000 before its lab retired. One of the biggest enhancements gave MPE/iX the ability to use drives sized up to 512GB. Getting this size of drive to work involves going outside of the 3000's foundation, both literally as well as strategically. External disc drives supply any storage beyond the 73GB devices which were fitted inside the HP 3000 chassis. This Hewlett-Packard part, numbered A6727A, was an off-the-cuff answer from Client Systems to the "how big" question. Client Systems built HP 3000s with this part installed while the company was North America's only 3000 distributor. But nothing bigger ever came off a factory line before HP stopped building 3000s in 2003. Outside of HP's official channel, however, a drive twice as large has been installed on a N-Class with a pair of 146GB drives inside. The Seagate ST3146855LC spins at 15,000 RPM, too, a faster rate than anything HP ever put in a 3000. These Seagates are still available; just $95 today at Amazon. Older 3000s, however, need single-ended drives for internal use. Allegro's Donna Hofmeister says the 3000's drive size limit is controlled by two factors: internal versus external, and HP "blessed," or off-the-shelf specified.